1. We were frustrated with hay waste. 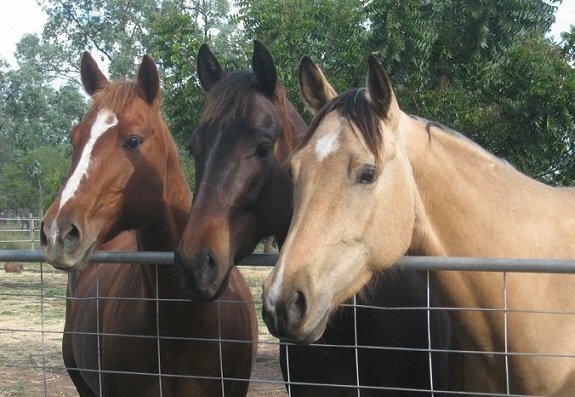 Unfortunately we had very limited pasture back then, so our horses were fed hay 24/7, which is very expensive! Every piece of hay saved from being peed on or blown away = $ saved! ​2. One of our young horses (Ace) had to be on stable rest for several weeks (due to a tendon injury) which had him going stir crazy. We noticed a big change in his mental health once we gave him one of our original slow feed hay nets. 3. There were NO Australian producers of slow feed hay nets back then. 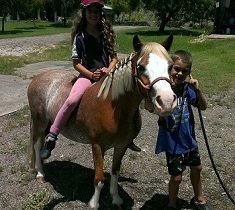 Encouraged by a mentor we went ahead and shared this great product with other horse owners, who we thought were perhaps struggling with the same things we were! The feed back was fantastic……….So began production of our slow feed hay nets! Since initial conception our nets have evolved, influenced by feedback from customers & stockists, not to mention using the nets ourselves every single day for a decade. Our nets DON’T have……..metal joins, machine stitching, or thin twine (which may come loose with use and get caught between horses teeth). Our nets DO have……..very wide openings for easy filling, UV stablised netting, top quality polyethylene draw string and are securely hand stitched with the exact same thick twine the nets are made of, also the adhesive we use to fully secure the stitching is non toxic. 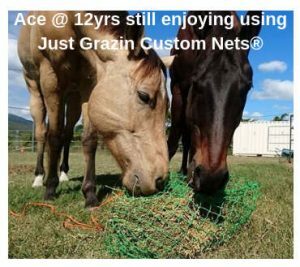 Just Grazin Custom Nets® are used in every Australian State & Territory, also overseas in Japan, Canada, USA, Spain, Norway, France, New Zealand and South Africa to name just a few! 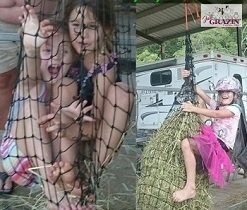 We are a small family owned & operated business, all of our hay nets are made locally at our property located in Queensland. For the first 7yrs our specialised hay nets were only available through a select number of feed stores and a couple of online stores. However due to requests & for customer convenience, in 2017 we launched our very own online store. Ace is the reason we first made a hay net. 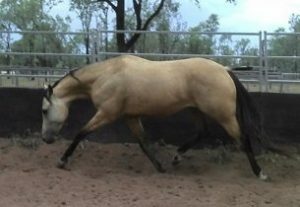 Injuring his tendon at 2yrs old, the vet instructed us to keep him stabled for several weeks. He was not a fan of being confined. His attitude changed incredibly when we gave him one of our original slow feed hay nets. He became noticeably calmer & less anxious about his imprisonment! 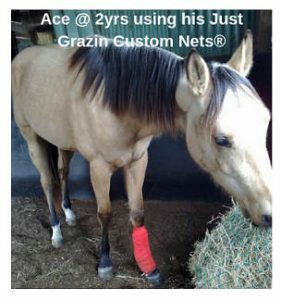 Ace has been using Just Grazin Custom Nets® every day of his life for the last decade! 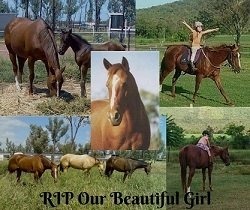 Cherrie was with us for 17yrs. Reluctant at first to slow down her hay grazin after so many years free range with her hay bales, she became a huge fan of Just Grazin Custom Nets® slow feed hay nets. She enjoyed grazin from them for nearly a decade! Cherrie would often choose to graze from her net, rather than free choice hay! 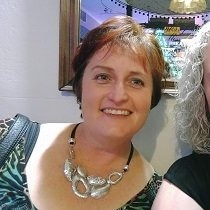 *Sadly we lost our beloved Cherrie unexpectedly 22/02/2017 RIP. Being a typical pony Jessie loves her food, shes the perfect candidate to give our nets a good work out! Since we relocated across to the coast a few years ago, we have struggled with her weight and also laminitis! Thankfully during the times we need to keep her off the grass, we have Just Grazin Custom Nets® to slow her consumption, making her hay last longer while shes locked up. It also helps stop her from getting too bored. 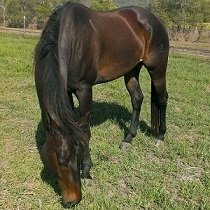 Just Grazin Custom Nets® are also perfect for soaking hay when her laminitis flares up. 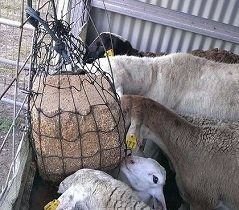 Our dorpa sheep love Just Grazin Custom Nets® regularly using the round bale or full bale nets, along with the small nets for the occasional lucerne hay treat. We also provide our sheep with a quality mineral block, which we hang in their night yard using one of our Mineral Block Nets. These girls really had a great time strength testing the hay nets! Just Grazin Custom Nets® are made with 48ply (3cm netting) and a robust 60ply (4cm & 6cm netting).